When Tarte was having 30% off during their recent friends and family sale, I couldn't resist picking up the Tartelette in Bloom Palette. I've been more keen on matte eyeshadows lately and thought this was a perfect neutral addition to my steadily growing palette collection. 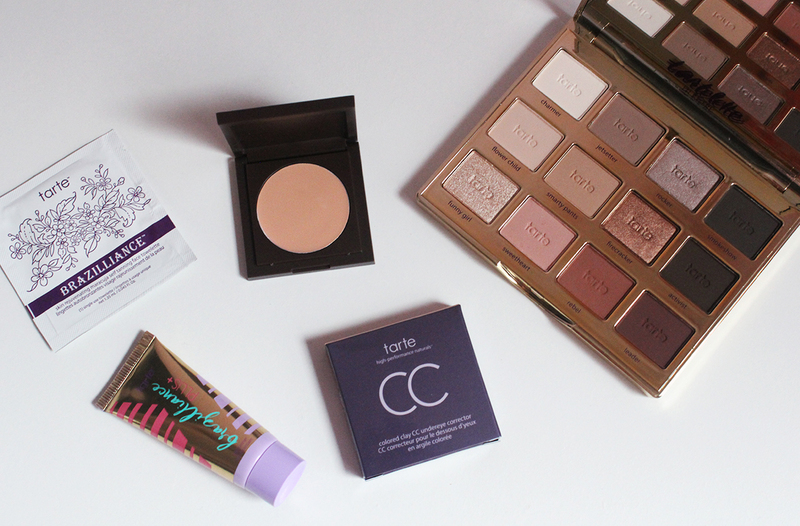 I also picked up the Tarte Colored Clay CC Undereye Corrector so that my order qualified for free shipping but I have half a dozen concealers on rotation so this one is sitting in my backup pile for the time being. I also got two tanning product samples with my order which I guess I'll try out before the first beach day of the summer. Anyway, enough rambling and let's talk about the star of this haul! Ah, isn't she gorgeous? This is one of the most perfect everyday eyeshadow palettes I've seen in awhile and it's been living on my vanity since I got it. It retails for $45 but with the 30% discount I only paid $31.50. Each pan contains .05 oz of shadow, which is standard. The palette is made in the USA and is formulated without parabens, mineral oil, phthalates, triclosan and gluten. I really like the slim packaging because it makes it easy to travel with. The plastic isn't the most luxurious material but it's sturdy and makes it easy to clean. The felt packaging of the original Urban Decay Naked Palette gathers dust like no other and the ink on the Laura Mercier Artist Palette has rubbed off on my hands before. Also the front cover has a pretty design that's not overly cutesy. 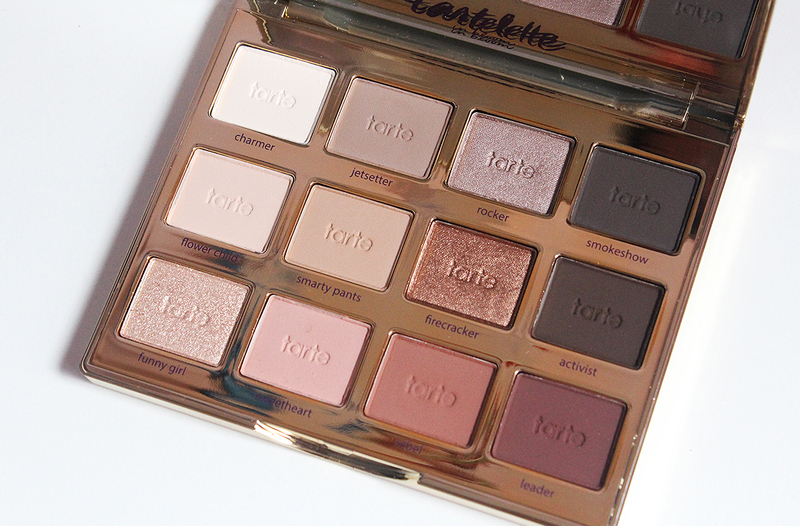 One thing I was surprised to find was that the Tartelette in Bloom shadows smell a bit like chocolate. It's very reminiscent of the Too Faced Chocolate Bar scent but with a hint of a plastic smell mixed in. You can't tell unless you purposely smell the shadows though. There are 12 shades; nine are matte and three are shimmery. The color selection is done very well because you get the lightest of shades to highlight with as well as the darkest browns to use as liner. I also like the way the shadows are arranged because it makes it easy to create a whole look with each row. The top row features cool shades, the middle is warm and the bottom leans red and plum. Now for my favorite part of any product review, the swatches! 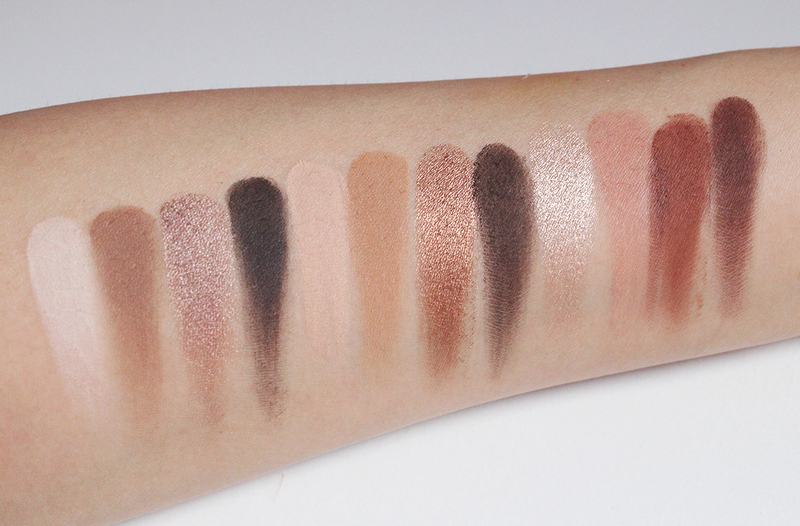 Almost every shade swatched beautifully and evenly. 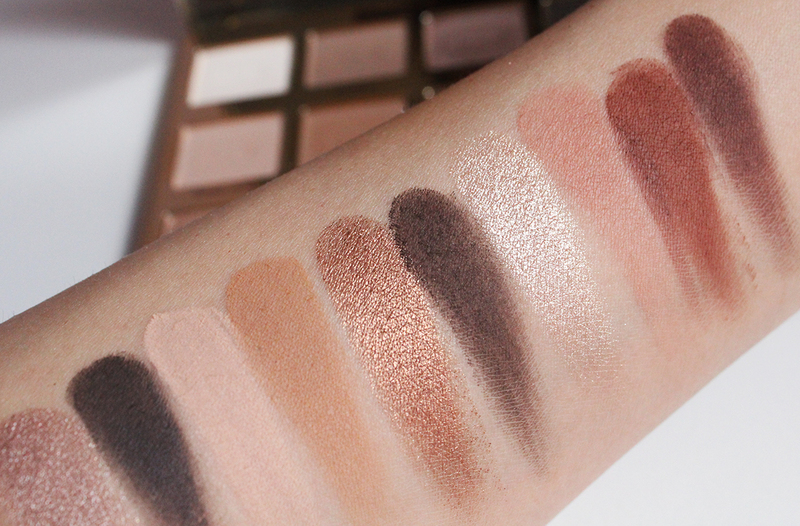 The mid-tone brown mattes swatched especially easily. They have a rich, buttery texture to them. The lightest off-white matte took a couple of layers to build up the color but I'm okay with that because I don't like a super stark brow bone highlight anyway. The champagne shimmery shade is a little chunkier than the other two shimmers but it's still beautiful as an inner corner highlight. Another close up of the swatches because why not. As with many shadows that have a creamy texture, these shadows do kick up some powder when you dip your brush in. I minimize fall out by tapping my brush off before applying the product to my eye lids. Overall I'm really happy with my purchase and have no qualms about adding another neutral eyeshadow palette to my already too-large-for-one-person collection. This is a palette I don't see myself getting tired of and can use it to mix and match with other eyeshadows very easily. I highly recommend it for those looking for a go-to palette!